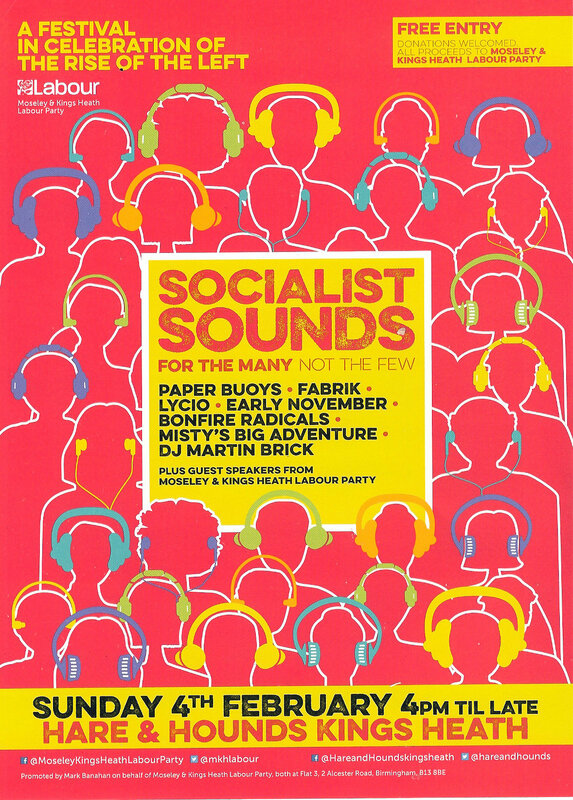 Join us with Socialist Sounds 4 pm, Sunday 4 February, Hare and Hounds, Kings Heath Brum and see our latest stock of great CND merchandise, badges, leaflets, posters, info and more. But if we don’t make nukes won’t a lot of people be out of work? A group of shop stewards in Birmingham puzzled over this problem 40 years ago. 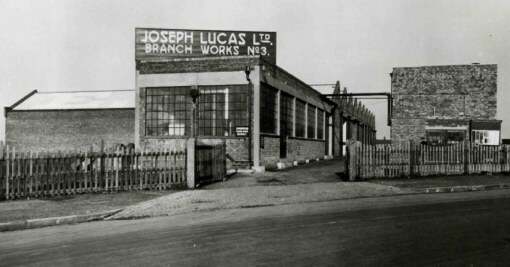 This picture above records a fascinating episode not only in the history of the work towards nuclear disarmament in this country, but also something that happened right on our patch in Hall Green in 1976-7, at the Shaftsmoor Lane, Lucas Aerospace Factory, pictured below. As you may know, there is nothing left of this factory now: it was demolished a few years ago and the site now stands empty. (A supermarket plan and care home plan failed.) but whilst all the things the shop stewards dreamed of never happened, and the tumbleweed may be blowing through that site on Shaftsmoor Lane ..
here is the history of what happened on that now empty site, which is to be commemorated in a celebration conference for the Lucas Plan to take place on Saturday 26th of November, 9-5 pm at the BVSC in Birmingham. 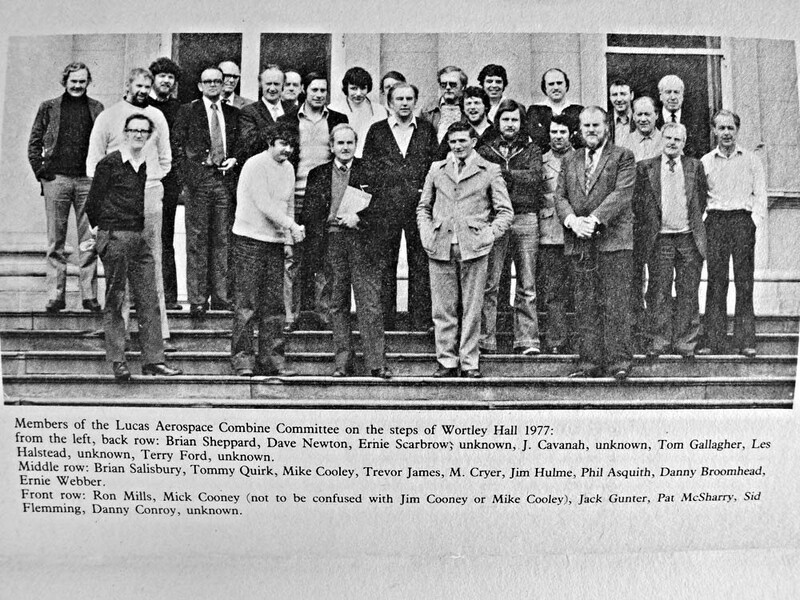 The Lucas Aerospace Shop Stewards Combine’s Alternative Corporate Plan (‘The Lucas Plan’) was launched in 1976 and became famous worldwide, sparking an international movement for socially useful production and workers’ plans. Facing the threat of redundancies, the Combine collected 150 ideas from shop floor workers about alternative socially useful products that could be produced by the company, instead of relying on military orders. Many of the innovations in the plan, such as hybrid car engines, heat pumps and wind turbines were commercially viable and are now in widespread use. Although the Alternative Plan was rejected by Lucas Aerospace managers, it was instrumental in protecting jobs at Lucas in the 1970s. The Combine was nominated for the Nobel Peace Prize in 1979 and Mike Cooley (an Irish-born trade-unionist involved in the Lucas Plan), received the Right Livelihood Award in 1982. More information about the Plan, including the 53-page summary of the five 200 page volumes, can be found at www.lucasplan.org.uk. On November 26th leading figures from the left, trade union, environmental and peace movements are coming together to celebrate it and use its ideas to tackle current crises. As part of the anniversary celebrations, there is a new documentary film screening of ‘The Plan’, book releases of the new edition’s of Mike Cooley’s ‘Architect or Bee’ and ‘The Lucas Plan: a new trade unionism in the making?’ and the Lucas Plan archive is being digitised. ‘The Plan’ is a new documentary film made with 5 of the workers who developed the Lucas Plan, telling the story of their campaign to transform their military orientated company towards socially useful production, will be shown at the conference. Why this matters to us now. Forty years ago those shop stewards at Shaftsmoor Lane were talking about one of the same things we talked about at CND Conference in October 2016. We also noted: ‘The decision of Unite the Union’s own Policy conference in July 2016 to welcome ‘the renewed focus Jeremy Corbyn has placed on defence diversification’ in the context of the priority he rightly places on world disarmament. 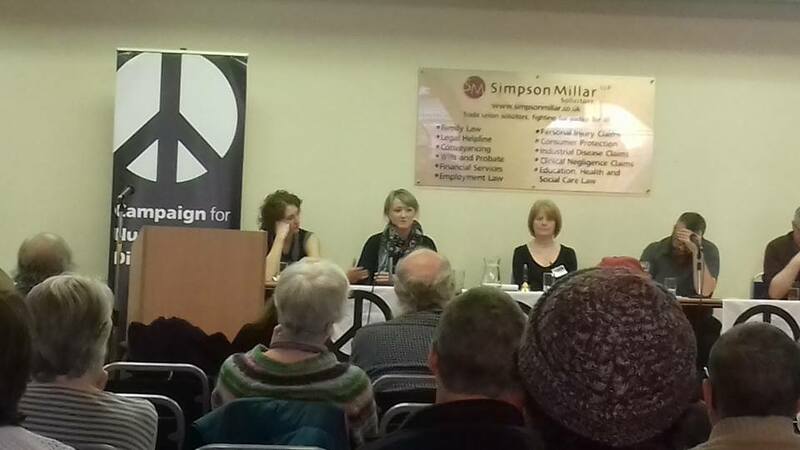 We believed that we must continue to expose the declining levels of employment Britain’s nuclear weapons systems have provided over the years and the failure of Trident replacement to provide any guaranteed employment to affected workers. So we have come full circle. The Lucas Aerospace plan was important 40 years ago. 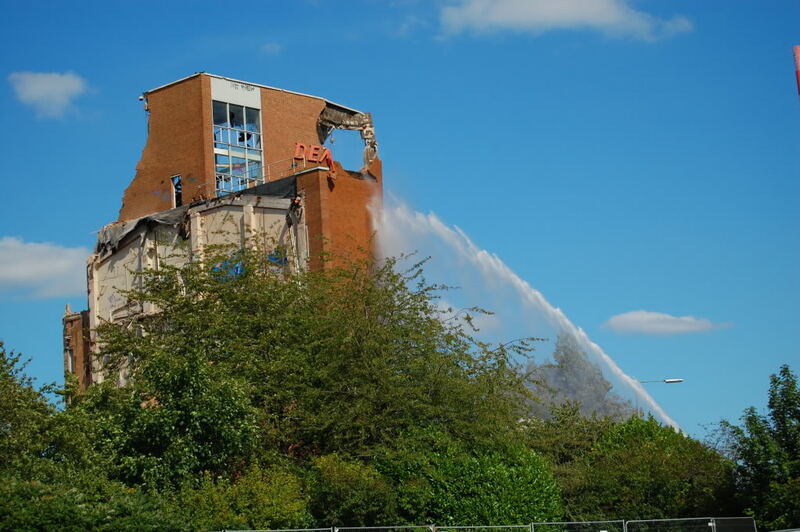 Lucas Aerospace in Hall Green is no more, but the thinking behind the ideas that were dreamed up there are even more vital today. This time let’s not use the tired old ‘we need to keep the jobs’ argument, spend 205 billion on making Trident. Instead come to this conference and see how diversification of nuclear weapons skills and technologies could work – now that we need it more than ever. See how we could build jobs, and keep nuclear weapons technology factories open in the future without Trident being in the picture. This was a well-attended and lively event with many good contributions from the floor after a stimulating speech by Bruce. The video of most of Bruce’s speech is below. 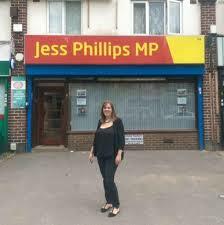 Following our visit to Roger Godsiff (MP for Hall Green) with a view to arranging a debate on Trident we dropped into to see Jess Phillips at her new permanent office on the Yardley Road in Acocks Green. At another busy surgery session (We have often noticed that being an MP is hard work!) Ms Phillips was keen to emphasise that she grew up in a CND supporting household and that her parents were active in Kings Heath CND when she was young. She agreed – indeed volunteered – that Trident is an expensive item, set to cost over 100 billion pounds in its lifetime, and noted that this would pay (for example) for all the nurses needed by the NHS at present. However she is concerned about international security issues and describes Trident as ‘the nuclear ‘deterrent’. She readily agreed to represent the Labour Party’s still pro-Trident policy position, and is willing to debate with Roger Godsiff on Trident at some time, early next year, probably in February, when the parliamentary recess is on (She thought that might be easier for both herself and Mr Godsiff.) We are grateful to Jess for being prepared to enter into the spirit of our democracy by taking part in a public debate on what is clearly at present a vital matter. We would also like to take this opportunity of thanking both Jess and Roger for voting against the recently highly controversial parliamentary motion to bomb Syria. This is an issue in which CND has taken some interest because there are still so many unanswered question. We feel that there is always a danger that any military operations between countries could escalate to something much worse and in this case we also note the particular tensions between Russia and the West which have come into play. Watch this space. We will announce the date and the venue, for this debate, and the exact wording of the motion, when these have all been arranged. 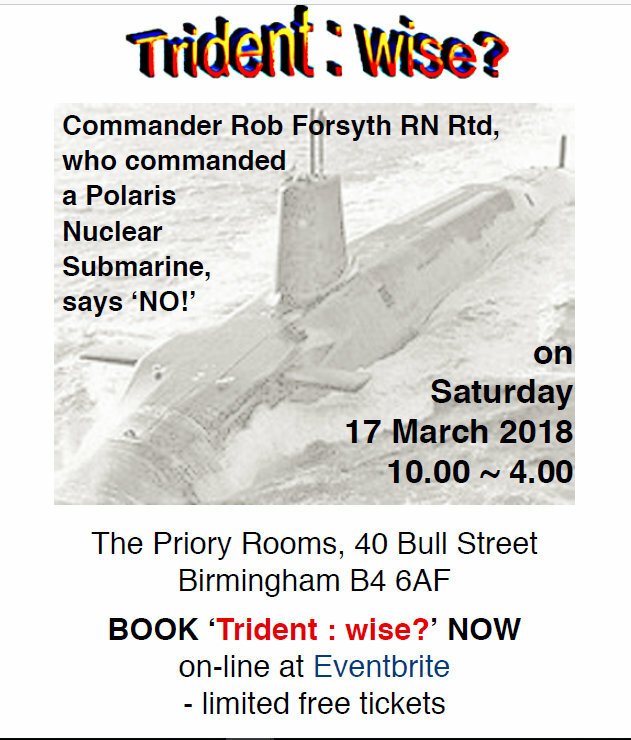 Meantime, we note that there has recently been quite a lot general feeling expressed that there should be a formal Trident based discussion in the West Midlands soon. 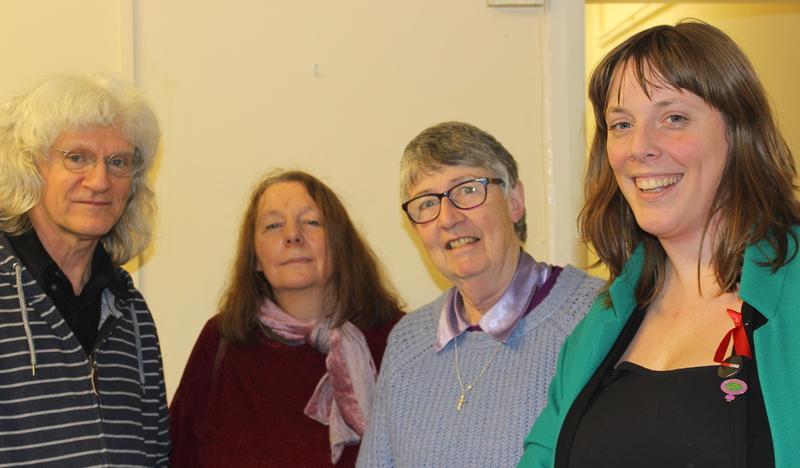 With this in mind we are also pleased to announce that we now have the support of West Midlands CND who will assist with additional funding and publicity. We caught up with him at the end of a busy morning’s MP Surgery at the Sparkbrook Health and Community Centre. A supporter of NATO, he believes that NATO should invest in non-nuclear weapons and also that as a country we should be spending more on properly protecting and equipping the soldiers we send abroad to fight in conventional wars. Often, he said, protective clothing, for example is inadequate. Another danger Mr Godsiff pointed out is that a nuclear weapon is not, these days, extremely difficult to manufacture by people who really put their minds to it. If the material is there it is also potentially available to terrorists. 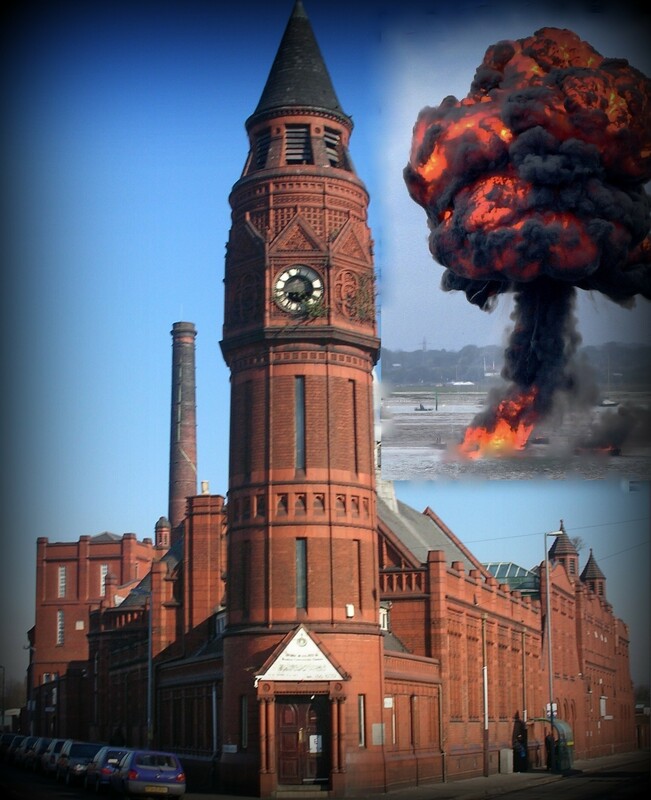 Should we nuke Small Heath? 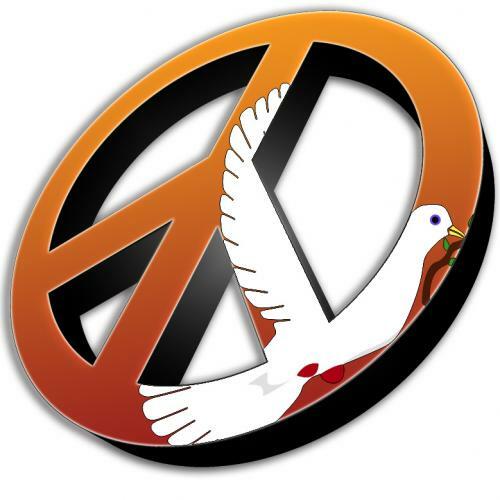 The real threats these days, Mr Godiff said, cannot be addressed by nuclear weapons. For example when he was MP for Small Heath there was a huge police operation because it turned out that one house contained a suicide-bomber who had strapped explosives to himself. How do you deal with a threat like that, he asked? 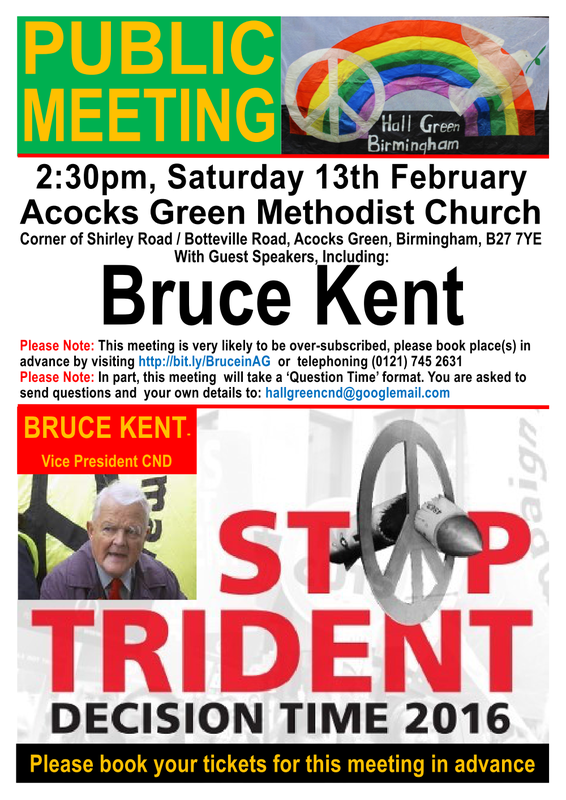 Do you nuke Small Heath? The answer is of course not! Nothing is more ridiculously inappropriate. Yet this is the real kind of threat this country is far more likely to face this days. It is frightening, but we don’t need nuclear bombs: – one war head kills about a million and spreads radioactive material for a huge distance around – to address this kind of problem. We also asked Mr Godsiff whether he might be interested in taking part in a local formal debate to discuss the renewal of Trident. He said that, subject to date, obviously, he would be happy to take part. So: watch this space.